Want to create art that’s out of this world? Look no further than these amazing outer space art ideas for kids – these are stunning enough to frame! I don’t think there is a person on earth who isn’t amazed, captivated and intrigued by the universe beyond our planet. When you get buried under the mundane of everyday life, one look at the starry sky above is enough to put things into perspective. Isn’t that amazing in itself? The night sky is a subject not just for the scientist, but for the artist too. The incredible beauty of outer space is so great, and to think there’s so much more we haven’t seen! So let’s try to capture a tiny bit of this beauty – by making art! 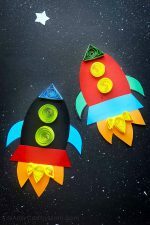 These outer space art ideas are perfect for kids and is a good activity for a Fabulous Outer Space Birthday Party. We absolutely love this watercolor planet project from Rainy Day Mum! 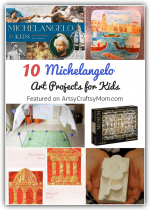 Not only is it frame-worthy gorgeous, it also involves multiple techniques without being too hard for young children. This crayon resist art project from The Crafting Chicks has some interesting art techniques for budding artists to try. The black watercolor on top of the crayons creates a beautiful effect that will delight the kids for sure! Spheres in space – not a big deal since we know that all our planets are spherical. 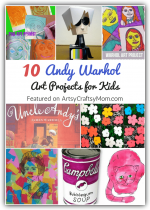 However, this art project from Art Projects for Kids is certainly something out of the ordinary! The instructions explain how the shading reflects the shadows caused by the sun. Now this is an art project that is absolutely gorgeous!! The black glue creates a glamour all of its own and the added textures make this a very interesting project. Perfect for the room of a space fan! Our galaxy is a huge one, with so many wonderful objects in it. Recreate the wonder of this enormous galaxy with this beautiful art project from Preschool Powol Packets. This is a good opportunity for kids to read up about galaxies and then visualize and paint what they understood. Got a free weekend afternoon with the kids? Then this marbled planets art from I Heart Crafty Things is a must try! 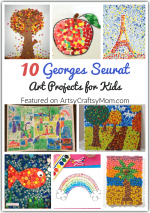 If all the kids have tried is watercolors on plain paper, this project will be a whole new ball game! 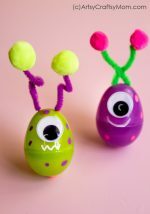 This is a project that everyone from preschoolers to preteens can try, adding their own touches and expertise as they like. The aptly titled Make it your Own shows us how to create our very own moon with sponges, salt, bottle caps, splattering, dabbing – anything that your heart desires! We love how this project is simple in terms of execution but the end result looks so complex and intriguing. For older kids, try making the planet sizes close to scale and get the colors also match accordingly. Get more instructions at Whatever. Even if we speak of ‘outer’ space, it still includes us and our beautiful planet! This project from Ten Kids and a Dog uses blue and green crayons melted to create an absolutely stunning ‘earthy’ effect. Add some shiny stars and you’ve got frame worthy art! This painting from Art Projects for Kids uses multiple art materials – sharpies, crayon and watercolor paints. The order in which each one is used is important to get the final contrast effect. Aren’t these outer space art ideas beautiful? Honestly, they’re so easy and open-ended, kids will have a blast doing them. And there are no rules, you can use any kind of art material or surface – even the sky’s not the limit on this one! 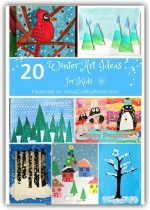 20 Winter Art Ideas For Kids that are Frame-worthy!